Six organizations from China, Russia and Mongolia signed a Memorandum of Understanding (MOU) on the conservation of the Siberian crane Thursday in east China's Jiangxi Province. Also known as the Siberian white crane, or the snow crane, the species is rated as critically endangered on the International Union for Conservation of Nature (IUCN) Red List. The six organizations -- the School of Nature Conservation of Beijing Forestry University, a Siberian cranes protection center in the city of Nanchang, two institutes of the Russian Academy of Sciences, a Mongolian bird conservation center and a nature reserve administration in Dornod Province -- signed the MOU of Siberian Crane Research and Conservation in Nanchang, capital of Jiangxi. 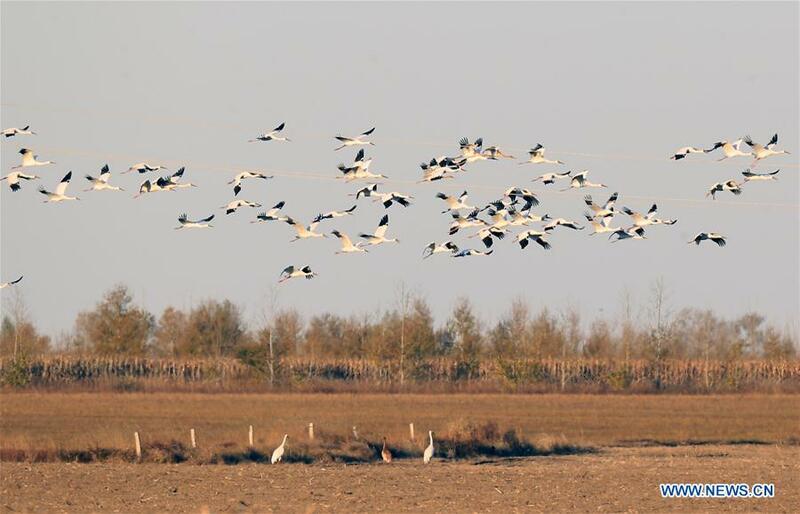 Guo Yumin, a professor with the Beijing Forestry University, said that all parties decided to join hands to protect the Siberian crane after multiple discussions. The participants will work together to collect and share scientific data such as breeding areas, population size and different habitats. According to the MOU, the Russian side will focus on the investigation of the breeding areas of Siberian crane, while the Chinese side is mainly responsible for the investigation of the bird's winter area, and the Mongolian side will carry out research on Siberian cranes in the summer area. Nikolai Ivanovich Germogenov, director of the Institute of Biology of the Problem of Cryolithozone of the Siberian Branch of the Russian Academy of Sciences, said the MOU was a sign of great progress, helping make the cooperation between the three countries more flexible. The world population of Siberian crane is estimated at about 3,600. There are three migration routes for Siberian crane - the eastern, western and central route. The eastern populations migrate during winter to China via Russia and Mongolia. But the western and central populations have declined drastically over the past 20 years due to hunting along their migration routes and habitat degradation.